Malpighiales are one of the most diverse orders of angiosperms. Molecular phylogenetic studies based on combined sequences of coding genes allowed to identify major lineages but hitherto were unable to resolve relationships among most families. Spacers and introns of the chloroplast genome have recently been shown to provide strong signal for inferring relationships among major angiosperm lineages and within difficult clades. In this study, we employed sequence data of the petD group II intron and the petB-petD spacer for a set of 64 Malpighiales taxa, representing all major lineages. Celastrales and Oxalidales served as outgroups. Sequence alignment was straightforward due to frequent microstructural changes with easily recognizable motifs (e.g., simple sequence repeats), and well defined mutational hotspots. The secondary structure of the complete petD intron was calculated for Idesia polycarpa as an example. Domains I and IV are the most length variable parts of the intron. They contain terminal A/T-rich stem-loop elements that are suggested to elongate independently in different lineages with a slippage mechanism earlier reported from the P8 stem-loop of the trnL intron. Parsimony and Bayesian analyses of the petD dataset yielded trees largely congruent with results from earlier multigene studies but statistical support of nodes was generally higher. 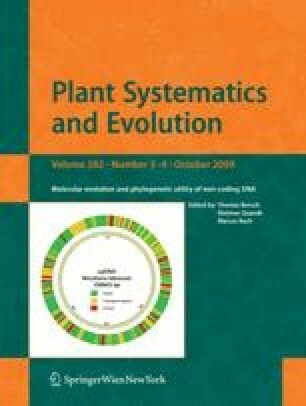 For the first time a deep node of the Malpighiales backbone, a clade comprising Achariaceae, Violaceae, Malesherbiaceae, Turneraceae, Passifloraceae, and a Lacistemataceae–Salicaceae lineage received significant statistical support (83% JK, 1.00 PP) from plastid DNA sequences. This study is part of the project “Mutational dynamics of non-coding genomic regions and their potential for reconstructing evolutionary relationships in eudicots” supported by the Deutsche Forschungsgemeinschaft (grants BO1815/2 to T.B. and QU153/2 to D.Q.). The funding of this project is greatly acknowledged. T.B. extends his thanks to the Deutsche Forschungsgemeinschaft for a Heisenberg Scholarship. We appreciate the support of Wilhelm Barthlott (Bonn) and Christoph Neinhuis (Dresden). The most important sources of material were the living plant collections at the Botanical Gardens of Bonn University. Their curator, Wolfram Lobin, and staff, especially Michael Neumann and Bernd Reinken helped wherever needed. This research received support from the SYNTHESYS Project http://www.synthesys.info/ which is financed by European Community Research Infrastructure Action under the FP6 “Structuring the European Research Area” Programme (grant to J.V.S., SE-TAF 794) We are also grateful to a number of other institutions and persons who kindly provided plant material: Françoise Prévost (French Guiana), the directors of the herbaria FR, MO, UPS, Edinburgh Botanical Garden (Scotland, UK) for material of Medusagyne oppositifolia, Bochum University Botanical Garden (Germany) for Dovyalis caffra and Osnabrück University Botanical Garden (Germany) for Calophyllum inophyllum; Rolf Rutishauser, University of Zürich (Switzerland) for material of Podostemaceae; Herbario Nacional de Bolivia, Stephan Beck, for duplicate sets of specimens of Caryocaraceae, Chrysobalanaceae, and Trigoniaceae; the Missouri Botanical Garden silica material collection; Elmar Robbrecht of the National Herbarium of Belgium (BR) for material of Irvingia; Kim Govers, Nees-Institute Bonn helped much with the sequencing on the CEQ8000 and the analysis of the sequences. Peter F. Stevens (Missouri Botanical Garden) provided helpful comments on an earlier version of the manuscript.